Gardeners today have less space, less water and seem less able to lavish time on their patch of ground. Yet ask nearly any gardener and they have no less desire for a beautiful garden outside their door. 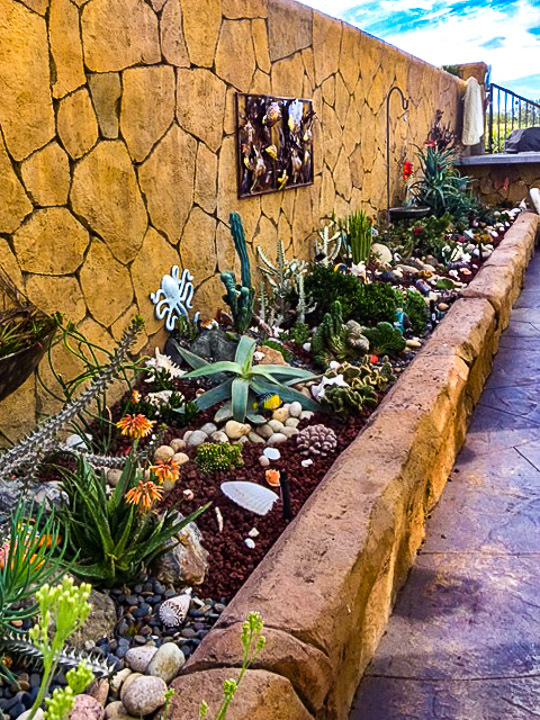 Inspired, creative thinking coupled with a fascination of the world of succulents enabled Lisa, a member of the Laguna Beach Garden Club in CA to transform a 15’ wide side yard strip of ground into a magical mix of low water use plants and artful touches, creating two thematic gardens. 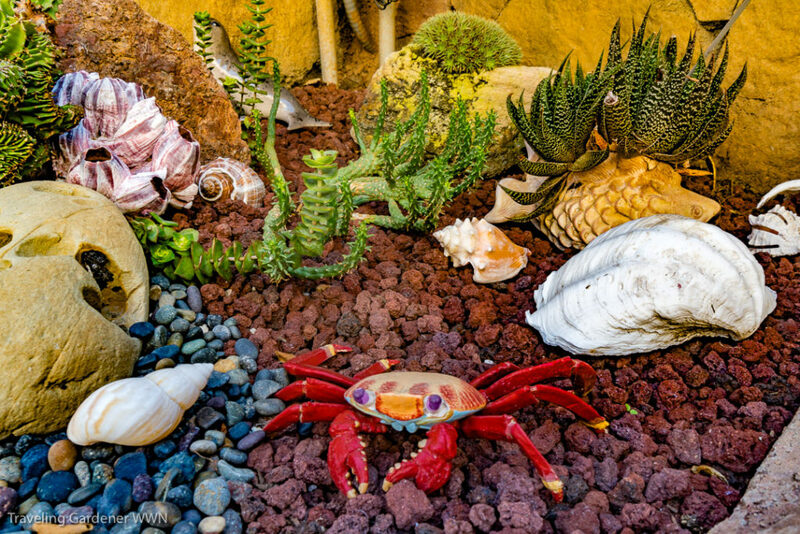 Inspired by the nearby Pacific Ocean, Lisa brought the ocean home in a succulent seascape garden. It would be easy to rush through a side garden expecting the exciting space to be further into the property, but this is a garden to explore in segments, like one snorkel framed view at a time. I live in the desert and my sea creature knowledge is very limited. I watch nature programs and make the occasional trip to an aquarium, but the moment I paused and looked closely at the seascape it came alive. Upper center a Deuterocohnia mounds like a sea creature. Lisa’s ocean has a floor of dark lava rock, and plants mimic the ocean waves, corals, and seaweed. 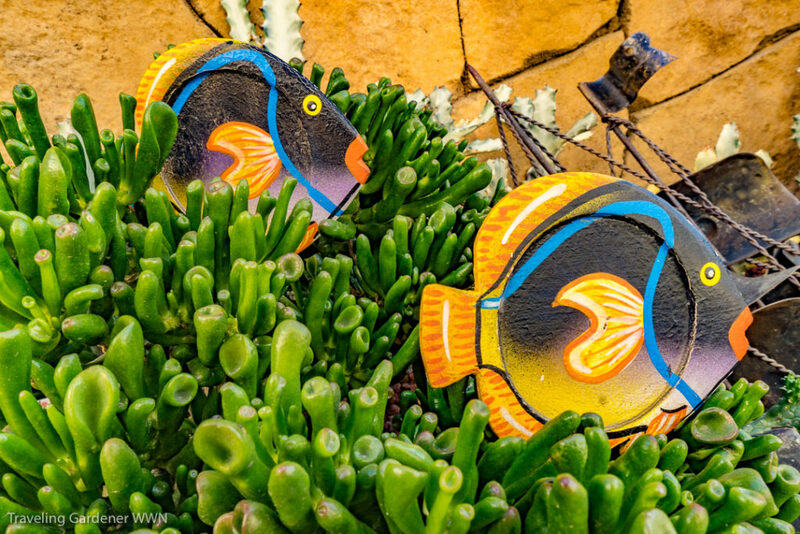 Colorful fish swim among the spires of Candelaria and angular Euphorbia grandiflora stems. 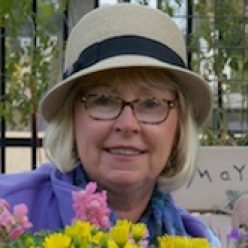 Lisa’s knowledge of the shapes, structures, and growing patterns of so many succulents allows her to mimic the underwater world. Red & White fish swims among Crassula arborescent undulatifolia, “curly jade” thin wavy leaves seem like ripples in a pool. 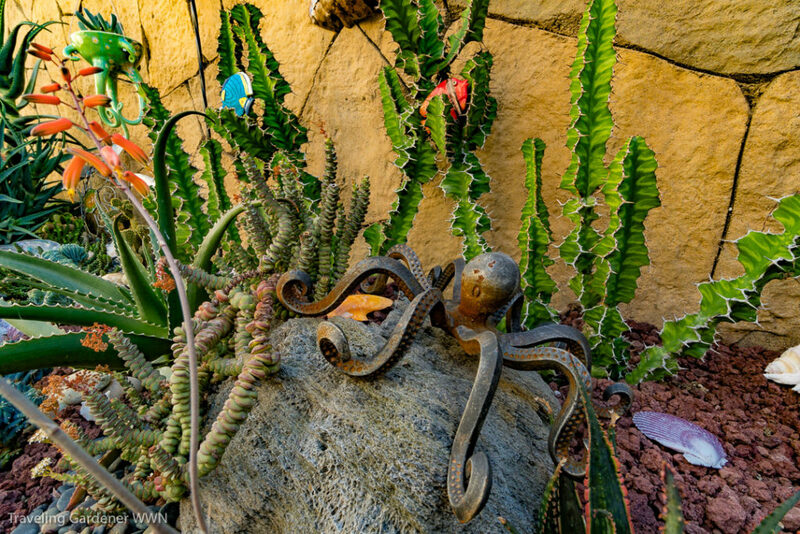 Lisa’s artistic whimsy is apparent as octopus, turtles, sea shells, and colorful fish swim around the plants. A sailing ship attached to the wall sails above the scene and a shipwreck lay on the ocean floor. Lisa continues the seascape theme into the larger rear garden. A sophisticated tiki bar is a place for grownup fun. 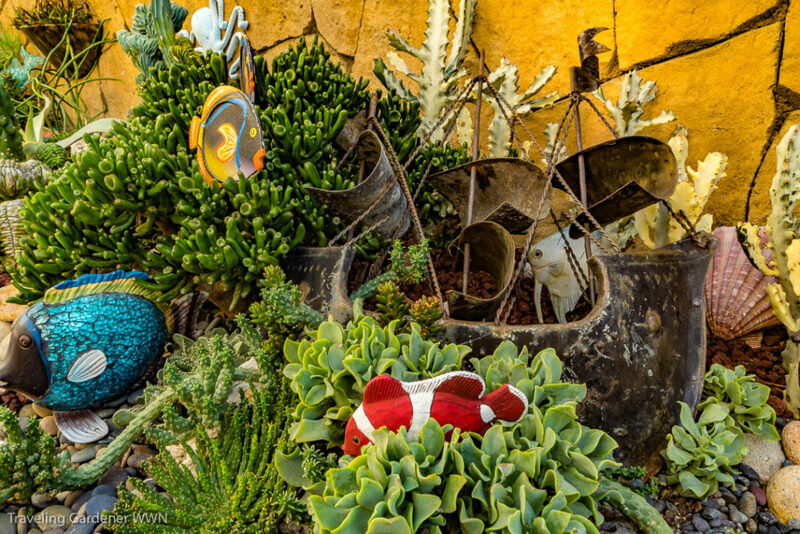 Colorful ceramic pots with blue and orange accents are filled with more interesting succulents. 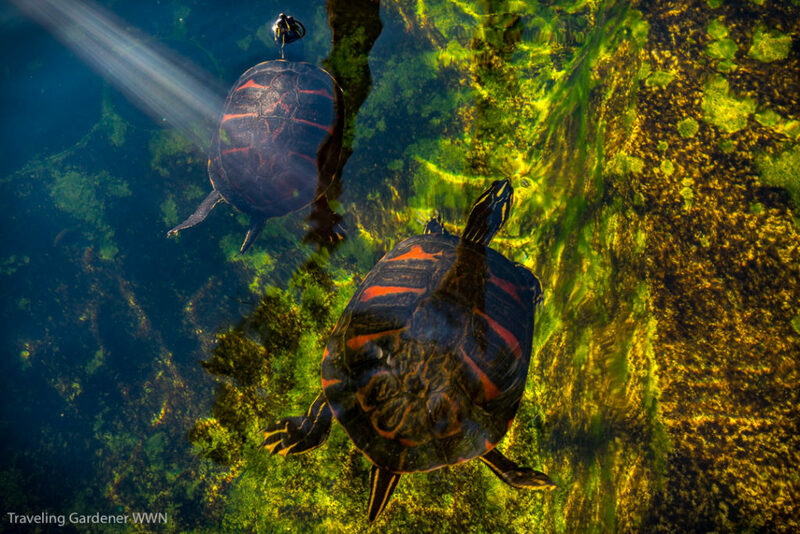 There is a deep koi pool shared with six large, colorful turtles. 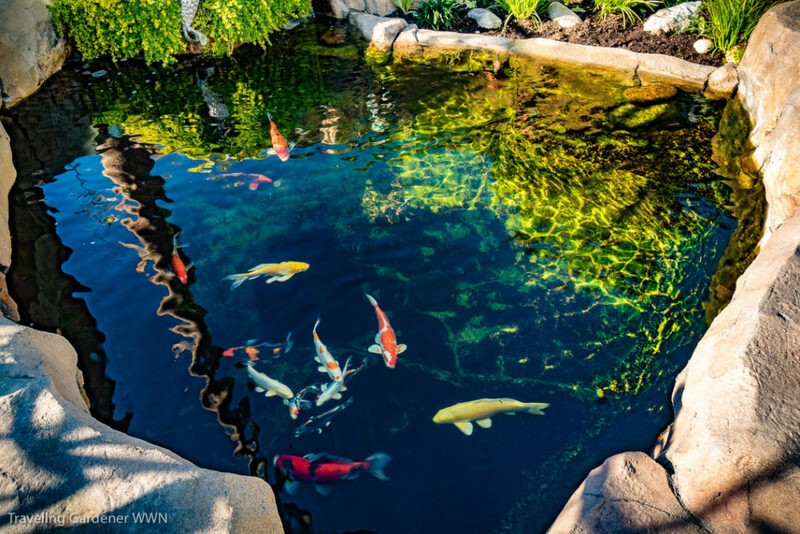 Lisa designed the pool with high sides and a deep pool, finding in her research it minimizes the risk of fish hungry birds invading the water. The entire garden invites you to kick off your shoes and relax. 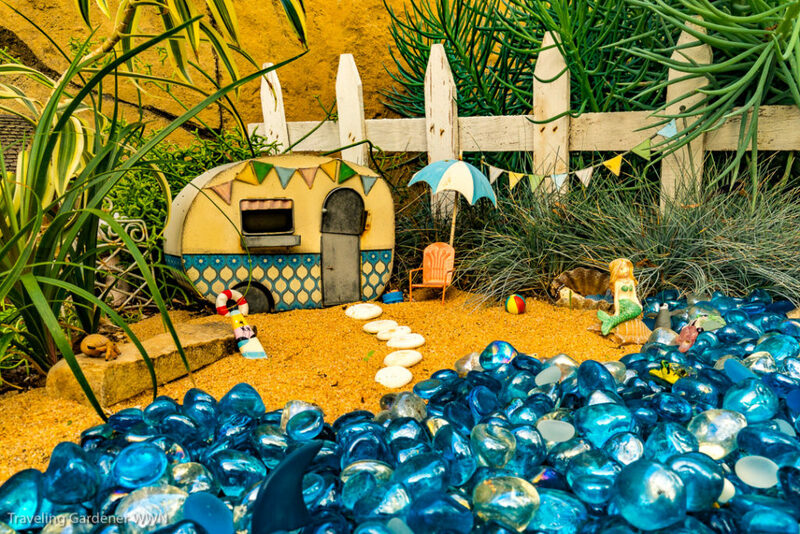 It would be enough to have created just the seascape theme in one’s small private garden, but Lisa’s creativity went on. 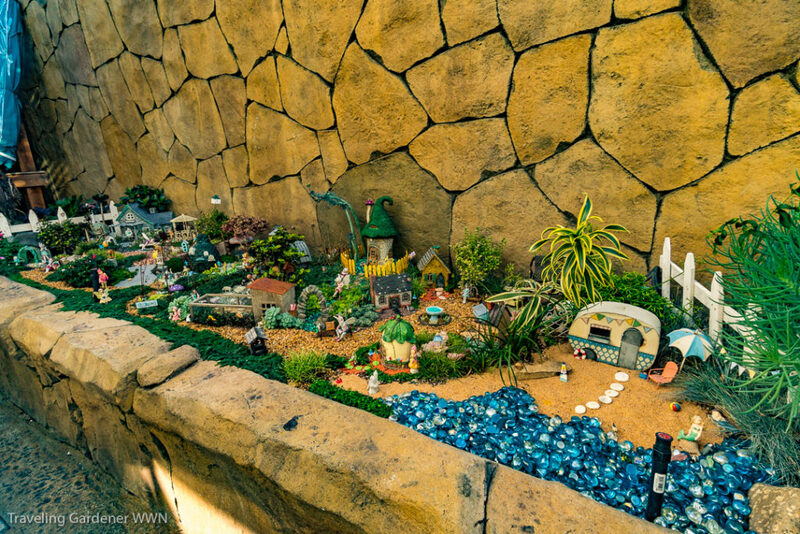 Along the side yard, there is a large fairy garden. 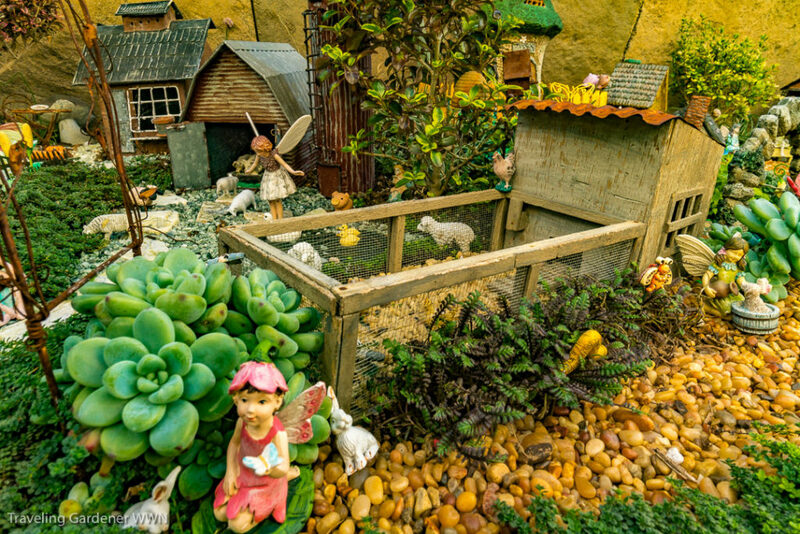 Fairy gardens are quite popular, though most exist in a single pot or two, Lisa designed a true wonderland in miniature. Her 12’ stretch of fairyland completely transformed my idea of what is possible. 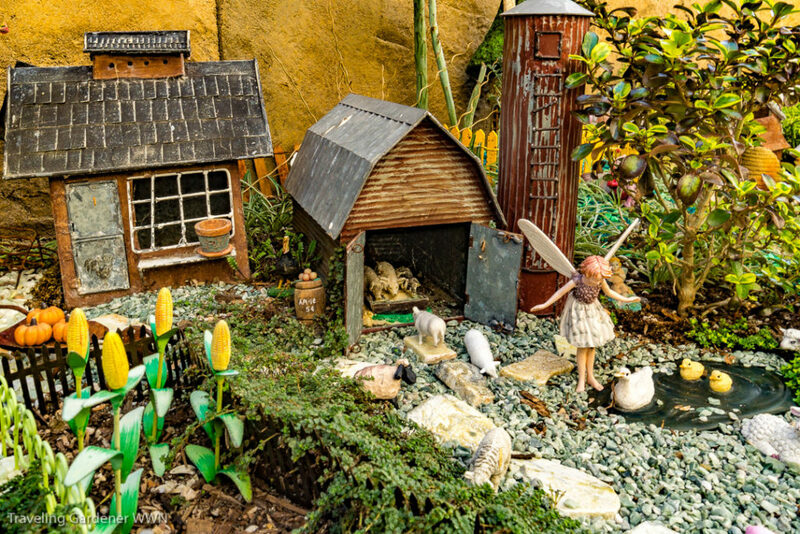 This garden provides hours of imaginative play for Lisa’s two granddaughters. Yet it is so imaginative it brings out the child in everyone, as you see a playground with a swing set and teeter-totter. You see the chickens in the coop, and pigs feeding on corn in the barn where a silo soars alongside. A fairy looks on while a mother duck and her ducklings swim in a pool. 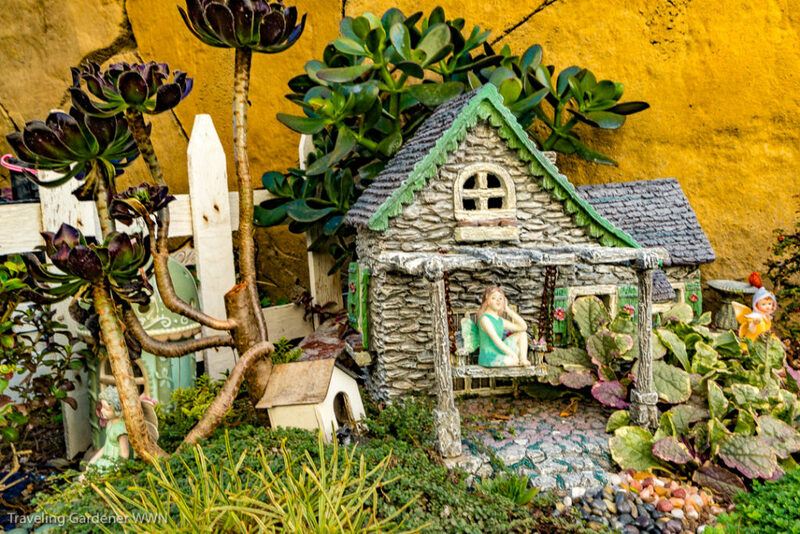 A fairy swings dreamily on a porch of a house shaded by a jade plant tree. Aeonium palm trees sway alongside the porch. 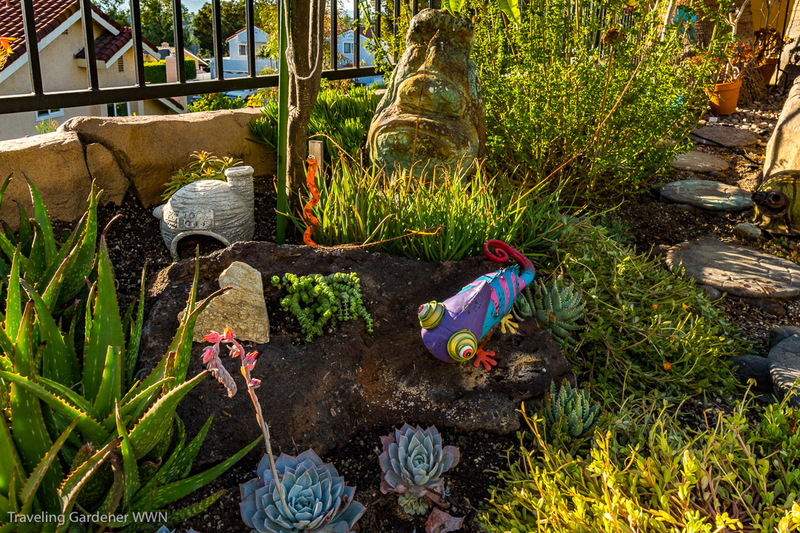 Echeveria make convincing shrubs behind a fairy wiggling her toes in the elfin thyme lawn. A blue glass seaside leads onto a sandy granite beach with a vintage travel trailer complete with umbrella and lawn chair. There is so much to discover here and each vignette teams with life. I was simply dazzled by the entire scene. The small space expands the garden as well as your imagination. Anyone who is lucky enough to have a walk-through side space that is just waiting for a purpose would be inspired seeing what can be done in just such a spot. 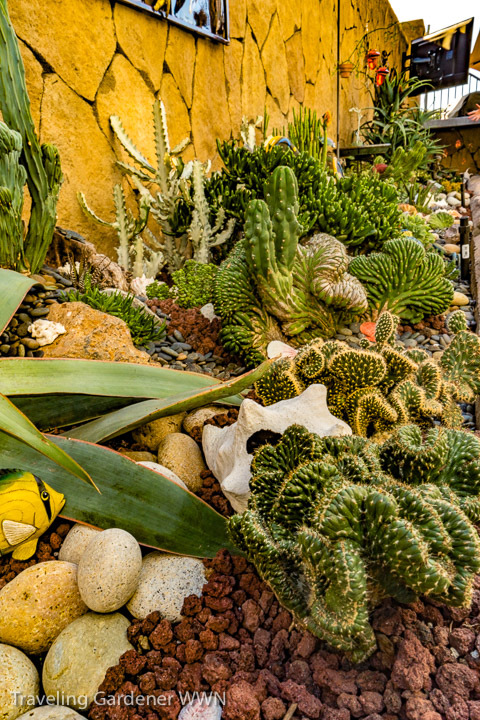 It is no wonder the creativity in combining such illustrative plants and artful elements won Lisa Gardener of The Year for the Laguna Beach Garden Club. Lisa, thank you, for letting me wander through. This is an AMAZING garden. Lisa created something special. It makes me feel like I am on the “Storybook Land” ride at Disneyland. Glad to get to experience this garden first hand as the creator is a good friend!! 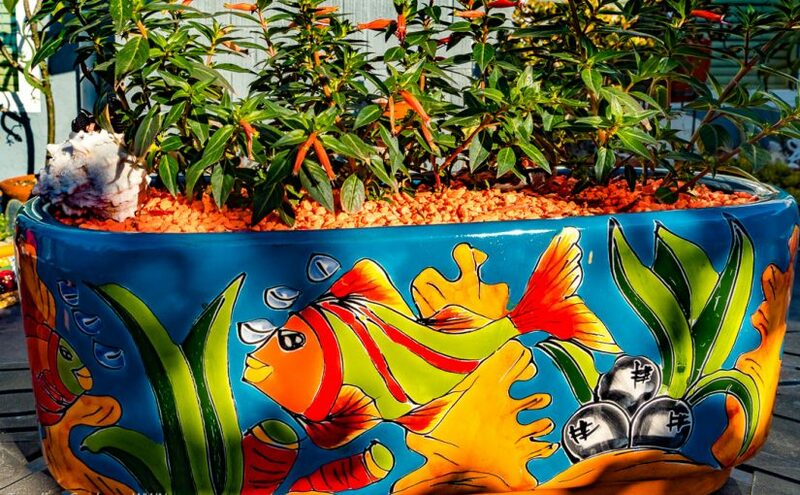 Splendor on the side is a creative, artistic and fun garden. for giving us this fabulous tour! What a creation! The gardener’s imagination is wonderful and the writer’s descriptions are equally entrancing. Thank you both! This is such encouragement for those of us who may not have a large space or a grandiose purpose, but can enjoy the delight of intricacy and imagination and dreaming up ideas for our own spaces. I’m inspired! What a great reminder that a small space shouldn’t be overlooked. I especially like how the succulents take on such size when occupied by tiny animals and fairies. She is surely making memories for her two granddaughters – and as a bonus, it’s not a doll house they have to clean up and put away every time they visit. this garden. It is so well designed, inviting and thought out. I was thrilled. This is one exciting and creative garden. Loved it! A friend shared this with me as I live in New Mexico ‘s high desert. I have shared it with the xeric club I belong to. It’s very inspiring. For me, the key word here is “imaginative.” It is a delight to see what can be done with such a small parcel. I’m certain that her grandchildren delight in this: Having three granddaughters of my own, I might try to do something akin to this for their enjoyment.